Why did the leader of the Hasidic faction of the United Torah Judaism party (Deputy Minister of Health Rabbi Litzman) make two visits to the prison where one Elazar Vigdorovich is serving a four year prison term for crimes involving the Gur Chasidic dynasty? Anyone who follows the ultra-Orthodox media and the news in Israel is aware of growing extremism, intolerance, and violence perpetrated in the name of religion. One example of this trend was featured in a popular Israeli weekend television news bulletin, with an added political angle; It raised a question as to why the leader of the Hasidic faction of the United Torah Judaism party (Deputy Minister of Health Rabbi Litzman) made two visits to the prison where one Elazar Vigdorovich is serving a four year prison term for crimes involving the Gur Chasidic dynasty. The question remains unanswered. The details of this case are particularly heinous. Since they haven’t been reported in English, although they were widely covered by the Hebrew media, we feel that it would be instructive to share them, in light of the exceptional treatment that this convict enjoys from the leading Hasidic political leader. According to the report, a woman (HB) married her husband in 1997. The couple experienced difficulties and went to a marriage counselor. In 2015 HB was divorced from her husband, and later the marriage counselor (PV) was divorced from his wife. HB's family and others belonging to the Gur Hasidic Dynasty suspected that the relationship between HB and PV had begun before the two of them were divorced from their respective spouses. These suspicions led to pashkvilim being posted against PV and incidents of harassment and intimidation against HB and PV. These rumors were adamantly denied and a rabbinic Beit Din that dealt with the case ruled that there was no inappropriate relationship between the two prior to their respective divorces. A young Gur Hasid by the name of Vigdorovich led the efforts to coerce PV to terminate his relationship with HB and when these proved to be unsuccessful – to force them out of the country and for HB to give up her 9 children. A young Gur Hasid by the name of Vigdorovich led the efforts to coerce PV to terminate his relationship with HB and when these proved to be unsuccessful – to force them out of the country and for HB to give up her 9 children. Vigdorovich worked with others, and when PV fled to Switzerland to escape from the constant assault, Vigdorovich and 2 others broke into the apartment where he stayed, beat him up harshly and threatened him with [a toy] gun to kill him if he and HB would not agree to go to the US for a year and for HB to give up custody of her 9 children who would remain in Israel. The two did not follow Vigdorovich's demands, and he schemed a plan in collusion with others to cause them to travel to the Ukraine, where PV would be employed in a synagogue, leaving their children behind in Israel. When that plan began falling apart and the couple was going to return to Israel, Vigdorovich decided to plant drugs in their luggage, so that they would be discovered at the airport. The drugs were seized by security personnel at the airport in Ukraine, and the two were arrested and later indicted, detained in prison and later in house arrest for almost a year and a half, separated from their children. The indictment filed against PV and HB carries a maximum penalty of twelve years in prison, but the International Department of the Israeli State Attorney's Office intervened, after learning the nature of the collusion and Vigdorovich’s role and arrested him. The legal process in Ukraine was terminated, and the couple returned to Israel. The Jerusalem District Court sentenced Vigdorovich to 4 years in prison and 400,000 NIS in compensation to the complainants. Vigdorovich, This twenty-five-year-old Gur Chasid, has been tasked with “fixing problems” for the Gur Chasidic dynasty in the past. There is no way that he had the financial resources necessary to carry these elaborate plans out on his own. While he could not counter the evidence against him, he refused to identify those who funded his escapade or instructed him to carry it out. All public information indicates elaborate criminal action, perpetrated in the service of others in the Gur Chasidic clan, the most powerful and affluent of all the Chasidic dynasties. 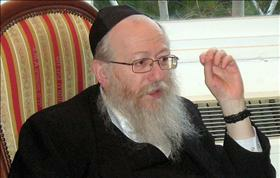 Without convincing alternative answers, one cannot separate Litzman’s visits to the prison, given the revolting nature of the crimes and Litzman’s position as top political leader of Gur, from this young criminal taking the full blame, but keeping his mouth shut regarding those who sanctioned and funded this course.